Dr. No was the first true attempt to bring an Ian Fleming novel to the silver screen back in 1962. Eight years earlier, Buena Vista Distribution had debuted its first feature film – an adaptation of the classic Jules Verne book, 20,000 Leagues Under the Sea. On the surface, these two movies don’t seem to have anything in common except for the fact that they’re based on famous novels. I mean, Dr. No is a spy thriller with plenty of romance, action, and intrigue while 20,000 Leagues Under the Sea is an adventure tale that is also an intriguing character study. In spite of this, I noticed several interesting similarities between them. I’m not going to argue that they’re the same film like I have in some of my other Movie Matchups, but there are some definite parallels worth noting upon closer inspection. 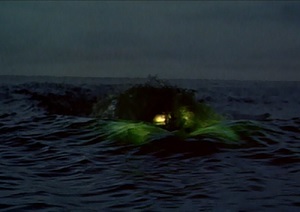 So let’s go below the surface and investigate how Dr. No compares with 20,000 Leagues Under the Sea. A seemingly mismatched group of heroes fight the villain. The heroes are searching for a killer dragon that turns out to be a machine. The villain graciously treats a hostile party to dinner, but it has an ugly ending involving a threat of drowning. The villain wants to see if he can turn the hero to his cause, which is to destroy humanity to create something better. A large creature attacks the heroes. One hero escapes his prison in time to save the day. The climax involves a nuclear catastrophe. Now let’s explore each point in greater depth. A ragtag team of heroes join forces to defeat the villain’s nefarious plan. 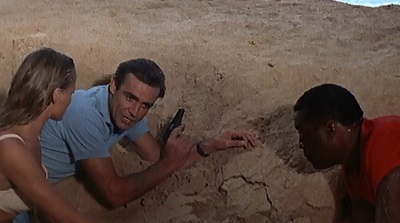 In Dr. No, James Bond is assigned to investigate the mysterious deaths of some agents in the Bahamas. In his search, he finds a woman named Honey Rider who just so happens to swim to the same shoreline he’s on. They share a desire to get revenge on the mysterious Dr. No, but other than that it’s pure happenstance that they wind up together. In 20,000 Leagues Under the Sea, Professor Pierre Aronnax, his assistant, Conseil, and a sailor named Ned Land are the only survivors of an attack on their ship. Even though they are associates, Aronnax and Conseil have different personalities. Aronnax is interested in scientific discovery while Conseil is a little more interested by wealth. Land is just interested in surviving and enriching himself. It’s purely by coincidence that they all survive and then find themselves prisoners on the villain’s ship. A dragon is really a machine used to scare and kill innocent victims. 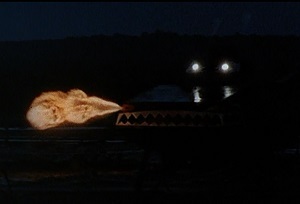 Bond hears reports of a dragon on an island, but when he gets a look at the beast, he sees it’s actually an armored tank. It kills one of his companions with a flamethrower. Aronnax, Conseil, and Land are passengers on a ship seeking a dragon that is destroying vessels all over the ocean. When they get up close, they learn that it’s an advanced submarine called the Nautilus. It kills most of their fellow crew members by ramming their ship. The villain invites the captive heroes to dinner, but he then inflicts great pain on them in the end. 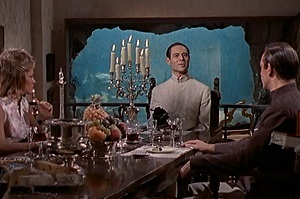 Dr. No captures Bond and Rider and takes them to his lair where he serves them a gourmet meal. He tries to impress them with his culture and refinement, but when his overtures fail to impress them, he has Rider taken to be drowned and Bond beaten and placed in a cell. The enigmatic Captain Nemo captures the three castaways and has them dine with him as his guests. 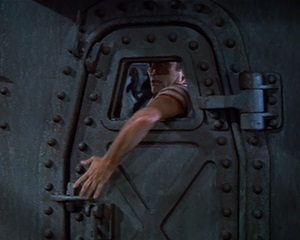 After Land behaves rudely and the other two don’t exactly see eye to eye with him, Captain Nemo orders them all out of the Nautilus, threatening to drown them all once it submerges. The villain wants to see if he can turn the hero to his side. The reason Dr. No didn’t kill Bond when he had the chance, but instead imprisoned him, is that he wanted to know if he could persuade Bond to join SPECTRE, the terrorist organization that wants to destroy the world to build what they consider to be a better one. He fails in the attempt. Captain Nemo doesn’t kill his three guests because he wants to see if he can change Aronnax’ mind about Captain Nemo’s mission to destroy humanity for what he perceives is the greater good. He’s more persuasive than Dr. No was to Bond, but he ultimately can’t bring Aronnax or the other two to side with him against humanity. A frightening animal nearly kills the heroes. I realize there’s a major difference between a huge spider and a giant squid, but hear me out. 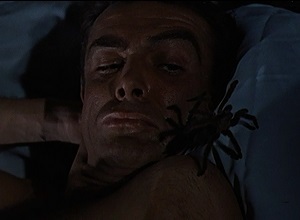 One of Dr. No’s henchmen tries to kill Bond in his sleep with a tarantula. Unfortunately for the villain, tarantulas rarely bite people. And even if they do, their venom isn’t deadly to a fully grown human. But they can be pretty creepy with all their hairy legs. A humongous squid from the bowels of the sea attacks the Nautilus and nearly destroys it. Despite the fact that a squid that large would probably be crushed by its own weight because of the insane scale of its proportions, it makes for a more exciting threat than a realistically sized squid, especially with all those giant flailing tentacles. The main hero breaks out of his jail and saves a lot of people from dying. 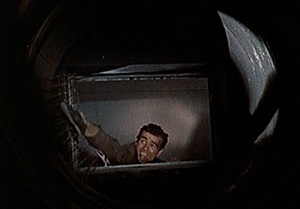 After being put in a prison cell, Bond crawls through some sort of ventilation shaft until he manages to kill the villain and save Rider from a drowning death. 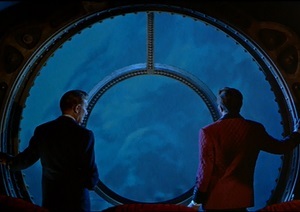 Land is in a section of the Nautilus that’s filling with water as a result of angering Captain Nemo one time too many. He manages to bust out of there in the confusion of the squid attack. He fights the squid off with a well-placed harpoon and actually saves the life of Captain Nemo. This is an interesting reversal because Land is the one who hates him the most of the three prisoners. His actions not only save Captain Nemo, but everyone else on the ship from certain death had the ship gone down. 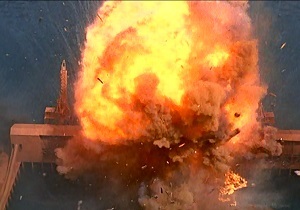 In the finale, the villain’s hideout is destroyed in a fiery explosion. Bond overloads a nuclear reactor and then leaves Dr. No for dead as his entire island base goes up in flames. Bond escapes with Rider on a boat that gently drifts toward safety. Captain Nemo sets his own nuclear reactor to destroy itself on a secret island. But he is mortally wounded in the process. Aronnax, Conseil, and Land escape the Nautilus and leave Captain Nemo to his fate as they head for civilization in a small lifeboat. You can hopefully see how Dr. No and 20,000 Leagues Under the Sea share a lot of similarities, even if they’re not exactly the same movie. I left out most of the first half of Dr. No in this comparison because I admit it doesn’t relate much to the events of 20,000 Leagues Under the Sea. Both of these films marked the dawn of a bright future for new film studios: Eon and Buena Vista, respectively. It’s kind of fitting that they should have quite a bit in common. You just have to look a little deeper to zero in on their similarities. This entry was posted in Movie Matchups and tagged action movies, disney, drama, films, james bond, jules verne, movie review, movies, movies based on books. Bookmark the permalink.